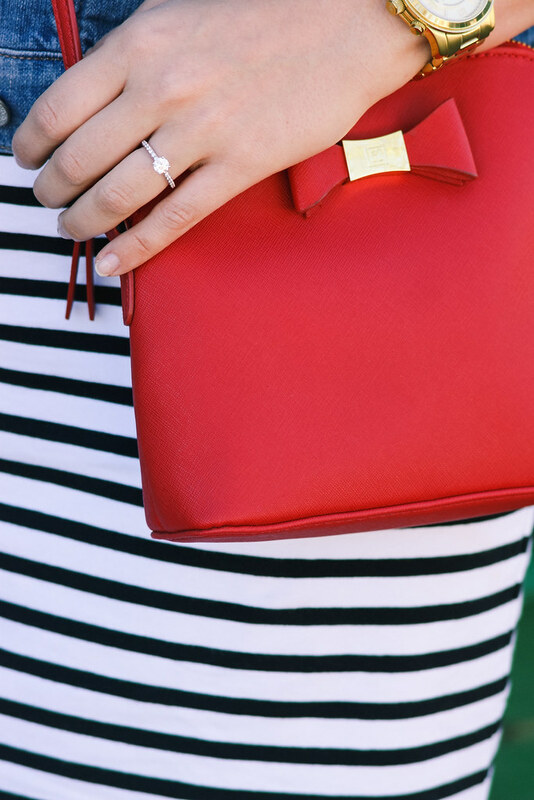 Is there anything more classic than stripes? 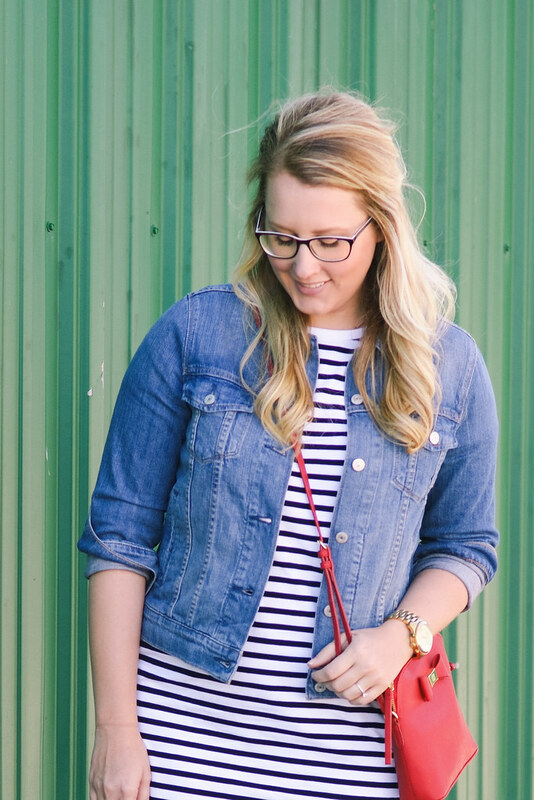 You guys know I love a good stripe, whether it's a shirt, skirt, pants, sweater, or scarf! 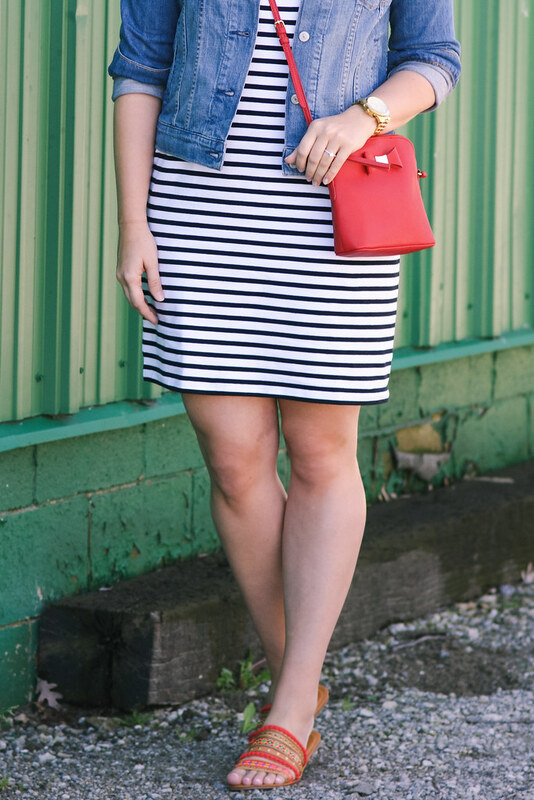 My favorite though is a striped dress - I just find them the most versatile! I used to wear a black and white striped dress all the time back in the day! I've always been on the look out for a short sleeved, black on white, t-shirt dress though. I've tried several over the years, but for some reason could never find the right one - some were too short, others were just too tight. I found this St. John's Bay dress at JCPenney though, and it's truly perfect. It's long enough on my frame (very important), has the type of stripes I've been looking for, and it isn't too tight around my midsection and hips (I'm wearing a size large). Best of all, I got it for $25! Online: An extra 30% off $100 or more select apparel, shoes, accessories, fine jewelry, home, furniture & mattresses. 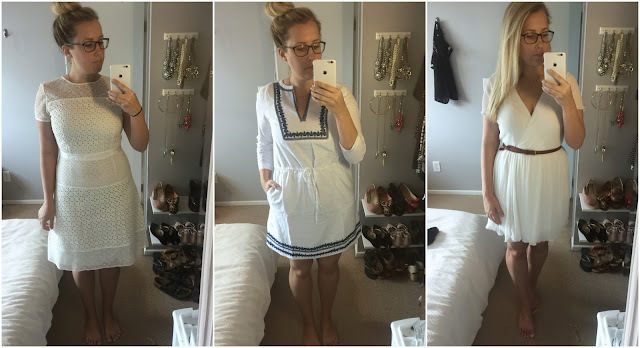 Thank you to JCPenney and ShopStyle for sponsoring this post! Last week, I just wasn't feeling it. I was having a bad week, and so I just kind of let myself sit on the couch watching HGTV and eating not the healthiest foods. The good news is by the end of the week, I was ready to get back to my healthier ways, and felt re-energized to work out. My friend Amy and I decided we were going to start BBG again, this time together, and it's been so good having a work out buddy! It's a bit of a commitment for us as we live 30 minutes apart, but we have made it work, and are excited to continue doing it together. It felt good (...but bad) to be so sore again! Looks like I kind of forgot to take pictures of food this week! For breakfast I had scrambled eggs or an omelet every morning. I brought bananas, Baby Bell cheese, and turkey sticks for snacks, as well as ate a bunch of apple and orange slices my attending offered me about every hour (I love apple slices!). For lunches and dinners we had a big thing of pulled pork in the crock pot with my beloved cheesy "potatoes", as well as chili, and butternut squash noodles with turkey meatballs. All were amazing! This week I would like to make two meals tomorrow to last us all week. Bringing my own lunches makes such a big difference in my eating habits! We are having a few friends over later to grill cheeseburgers and brats (YAY! ), as well as having mac and cheese, salt potatoes, lemon bars, and cupcakes. I can't wait! weigh in: -0.0 lbs (total: -10.0 lbs). Not surprising considering the weight I probably gained last week, but glad to be back at this point. Can't wait to see where I'm at in a week from now (probably still unable to walk correctly haha). On fetal ultrasound, another way of telling whether a baby is male or female besides "the money shot" is by looking at the bladder! The female bladder will be less rounded than a male bladder because the uterus is in the way! Dr. Barry Marshall proved the link between H. pylori (a type of bacteria) and stomach ulcers by drinking a petri dish of the bacteria! Now that's dedication to science. Don't worry, he was treated, and then won the Nobel Prize, so it all worked out in the end! The masseter is the strongest muscle in the body. What do bloggers do on press trips anyway? 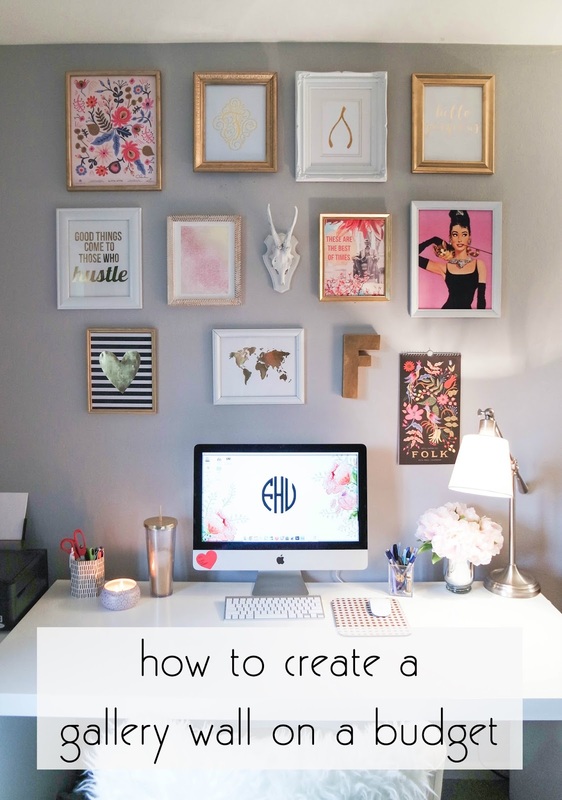 Such an interesting read into this part of blogging I've never gone on! 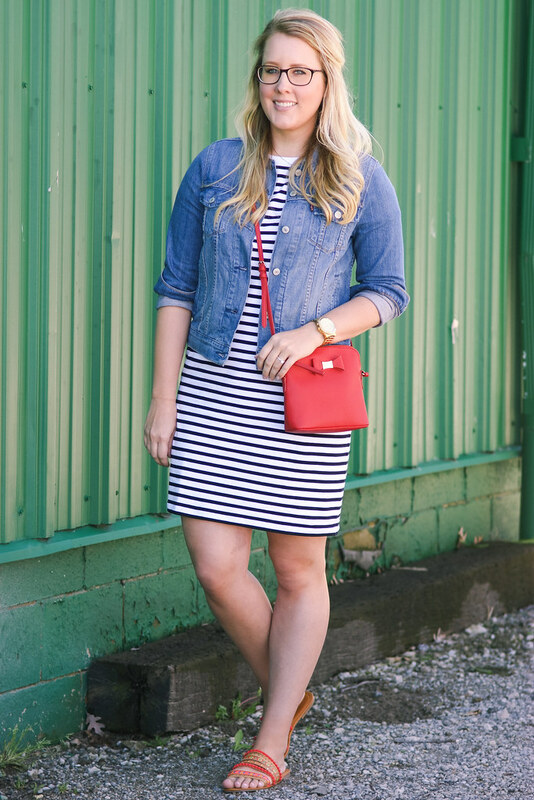 Loved this look on Kendi - perfect summer outfit for those of us who hate summer clothing! 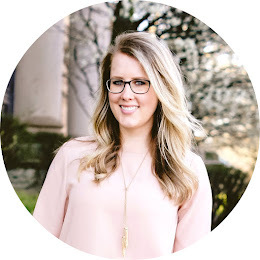 As we start our own house buying process, it was so reassuring and inspiring to see Emily's look back at her house over the years. Can't wait to explore more of her archives! I saw this skirt yesterday while we were in Cleveland, and literally ran up to it because it's like my ideal skirt. Now we just wait for a good sale. Seriously, I need that skirt in my life. 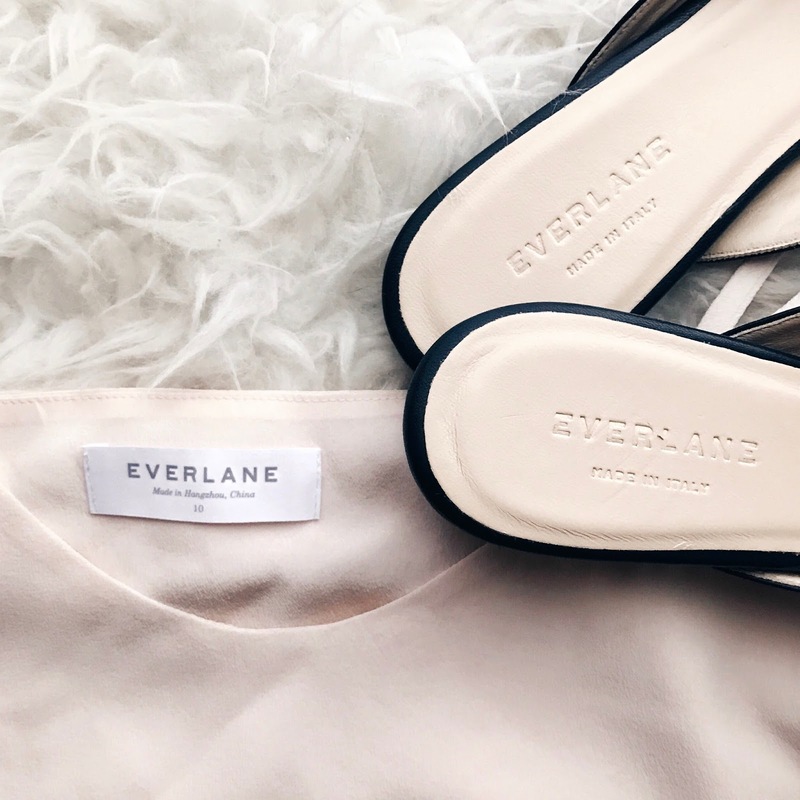 These Sole Society sandals come in two super versatile colors - you could wear these and only these sandals literally all summer long! Topshop makes a pair of black distressed denim that are basically exactly like my 7FAM jeans (seen here), but for less than 1/2 of the price! Unconventional beauty tricks that actually work. Wearing a dress as a skirt! Still one of my favorite outfit posts ever! Does where you do your residency usually end up being where you practice medicine, or is it easy for any physician to move around? All I know is law school because my husband is an attorney, and unless you went to Harvard or something, in my experience most law school grads end up working in the city or state where they went to school. You can practice wherever you want, and aren't obligated to stay in the state you did your training in! I know for most lawyers, you practice in the state you pass the bar in (but not always), but our board exams are national, so we can practice anywhere. Our long term plan is to live where we are doing residency for the next 6-7 years, and then move to upstate New York permanently. I'm getting ready to take Step 1 and I'd love to treat myself to new pajamas to wear the night before (I'm superstitious like that). Any suggestions for cute nightgowns/pajama sets? Oooh, I love that! What a fun way to treat yourself before such a big exam (good luck!!!). I have a couple of cute suggestions. If you want some bright and floral and fun, here's a really cute set from Nordstrom. J.Crew has an adorable gingham set that I just think are so pretty. If you want some inexpensive cute shorts, check out this pair from Old Navy. I love that bright yellow! Congrats on your match! I'm starting med school next fall, and like you, I'm going to have to rely on loans for my income. What recommendations or suggestions do you have for this process? I'm slightly terrified but I have to remember it will all be worth it in the end! Taking out a significant amount of loans is definitely scary - it's a huge amount of money! Just remind yourself that most doctors have to take out loans to pay for school, so you are not in a unique situation. All but one of my friends had to take out loans to pay for school, and we all know that we will be able to pay it off. 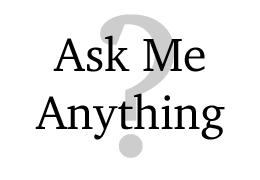 My suggestions would be to make a budget plan so you know how much you have to take out - you may not need the full amount of money every semester (although there are some where you need the full amount to pay for step exams and application and interview season). When I got my loan checks, I would calculate about how much all my bills would be every month, and put that into one savings account. Then I gave myself an allowance (for groceries, gas, and fun), put that money into a separate account, and had it automatically transfer that to my checking every two weeks (like a paycheck!). The rest I put into another savings account which I used for big school expenses (each board exam is around $1000) and unexpected expenses. That system worked out really well for me! Just know you will have a job eventually where you will be able to pay back loans. We plan on staying in our house we will be in for residency for several years after we are done with training so we can pay off our loans quicker - knowing we are doing that gives me the piece of mind that we will be free of our loan debt quicker. 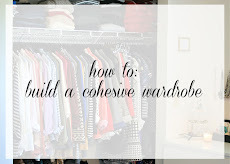 on the blog: I loved all of your advice on figuring out your personal home style. You guys had such insightful comments! My MFM rotation started, and it's been so interesting! The MFM (maternal fetal medicine) doctors are the high risk ob doctors, so we see a wide variety of problems. Some from the simpler gestational diabetes, to patients with rare infections and cancers (while pregnant). We also see a lot of routine 20 week ultrasounds though, so it's been an interesting mix of patients. Happy Easter! I hope you are getting to spend some time with families and the Easter Bunny. CR's parents sent us an edible arrangement (I've never had one! ), so we have been enjoying all that delicious fruit! I have been playing with a bunch of new products over the last few months. Some I found by falling into an internet black hole, some I tried samples and loved, some were sent to me, and others were suggested by friends. I didn't think any really warranted a full review post (although a couple will have follow up posts with continued use), so I wanted to do a quick first impressions and mini review of the products! 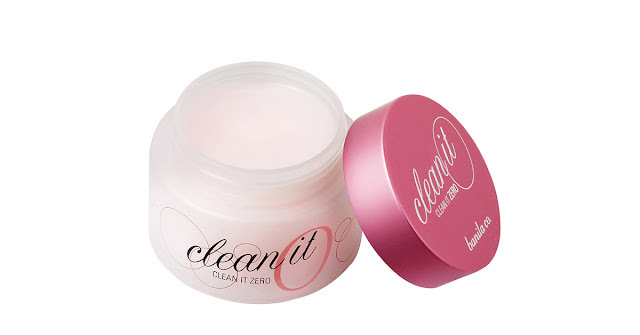 Banila Clean it Zero Cleanser: K Beauty and its 10 step nightly routine has been a big thing discussed online for a while now, and every time I read about some people's routines, I get really confused about all the different steps, and what each of them does and then I just give up and continue my standard make-up removal, cleanser, treatment, moisturizing routine I've been doing my whole life. But then I recently read Sydney's post about her new routine, and man, her skin does look pretty amazing, and since her post made it a little easier to figure out how to go about all of this stuff, I purchased a few things. The first one is this balm cleanser, the first step in "double cleansing". For those of you who use coconut oil to remove your make-up, this is pretty similar, except it cleanses more and doesn't leave as oily of a residue behind. You scoop a little of the solid balm into your fingers, rub all over your face and eyes, and then cleanse with warm water. It does a great job of removing all of my eye make-up! I then cleanse again with my go-to Paula's Choice cleanser to remove all remaining make-up and cleansing balm. My face feels so soft after, and I like that I don't have to wipe at my face with any clothes or wipes or pads. 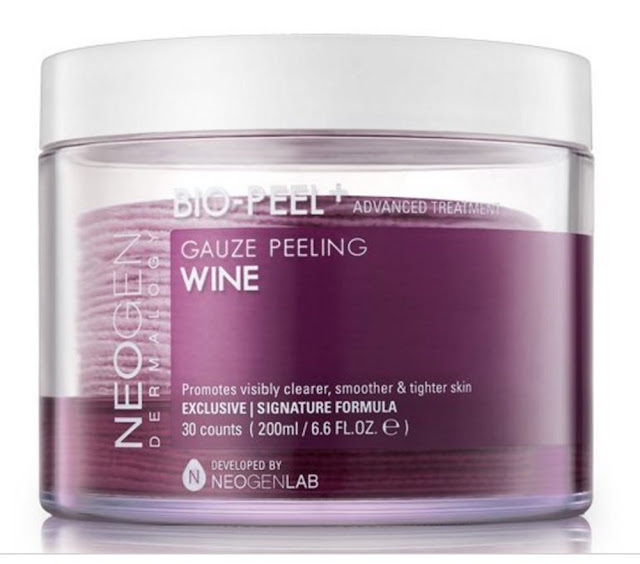 Neogen Wine Exfoliating Pads: You guys know I'm all about exfoliating - when you have dry flaky skin, anything that helps your skin look bright and not dying wins in my book. I've seen these wine soaked pads mentioned a few times over the past few months, so I figured it was time to try. I use these 2-3 times a week after double cleansing. Basically they smell like a combination of red wine and grape jelly - if you're sensitive to smells, you will probably hate this. I love it, I think it smells amazing! These are little gauze pouches, basically - you stick your finger in them, use the "rougher" side first (it's not rough at all) and then use the softer side after, to rub all over your face to exfoliate. My belief in this kind of over the counter skin care product is that it won't really change what your skin is really like - chances are, your pores won't be that much smaller, your acne isn't going to magically all disappear, your dark spots aren't going to just go away. But what it does in the day to day feeling of your skin is real - it does change how my skin feels, and how other skincare products react with my skin. So I would say in this situation, my skin does feel smoother! But it's not a magic product, just like most skincare products aren't. If you want a nice smelling exfoliator that helps with flakiness, this is a great product to try! The Ordinary oils: In Sydney's post, a commenter said that there's no need to pay $40 for some of the face oils because you can get them for a quarter of that price from The Ordinary. I had never heard of this brand, so I fell deep into the internet hole about this brand. 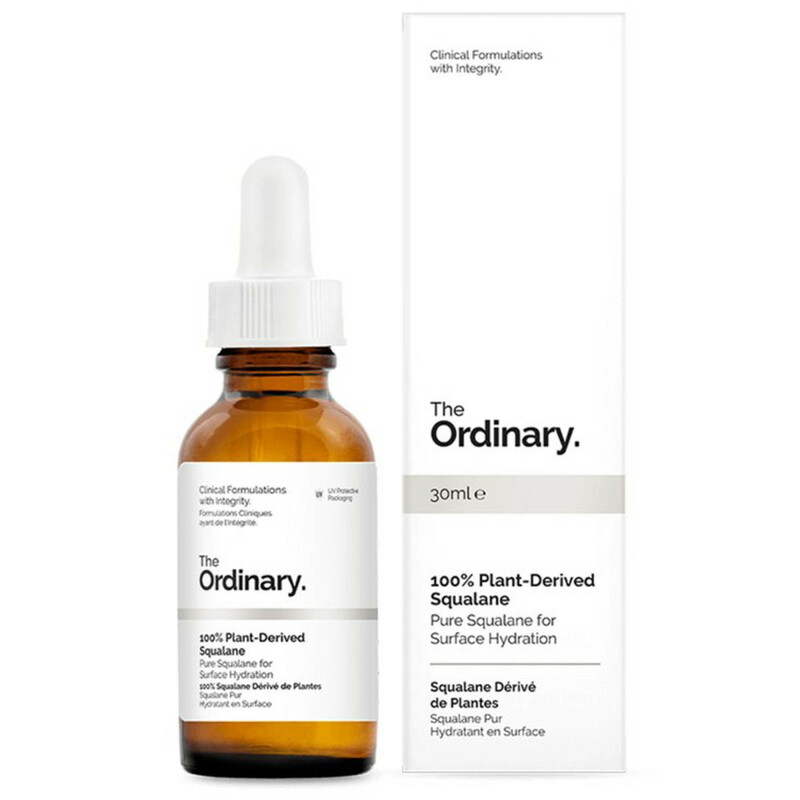 Basically, The Ordinary provides the active ingredients without any of the fillers...and for fair prices. I don't know if it's because we are so conditioned to see $100 bottles of face oil or if it's because we believe you can't buy good products for inexpensive prices, but I was pretty shocked when I saw that you could get the same 100% Squalane that sells for $60 from some brands for EIGHT DOLLARS from The Ordinary. $8! So at those prices, what do you really have to lose? Here's my disclaimer: I do not own the expensive bottle of Squalane, so I can't compare the two, but this little $8 bottle of oil feels pretty amazing. At night, after cleansing and exfoliating, I pat the squalane and rose hip see oil on my face. My face glows - I seriously can't stop looking at it because it looks so bright and clean and glowy! 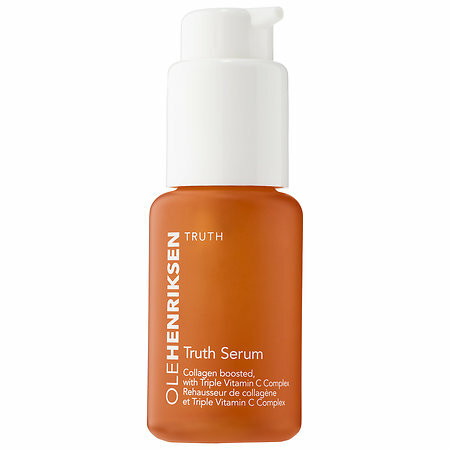 Again, I think this is one of those products that can change your skin when you apply it, but I have no idea how much it changes your skin over the long run, if that makes sense. The only product I have ever used where I noticed my skin actually changing is my prescription tretionoin cream - that product is the holy grail of changing your skin. These products change my skin on the daily, and so if you are looking for a few inexpensive face oils to try, The Ordinary is a great place to start! I've been very impressed with the products in the few days I've used it so far. Chanel Le Volume Mascara: I went to a Nordstrom Beauty event about two months ago with Katy. 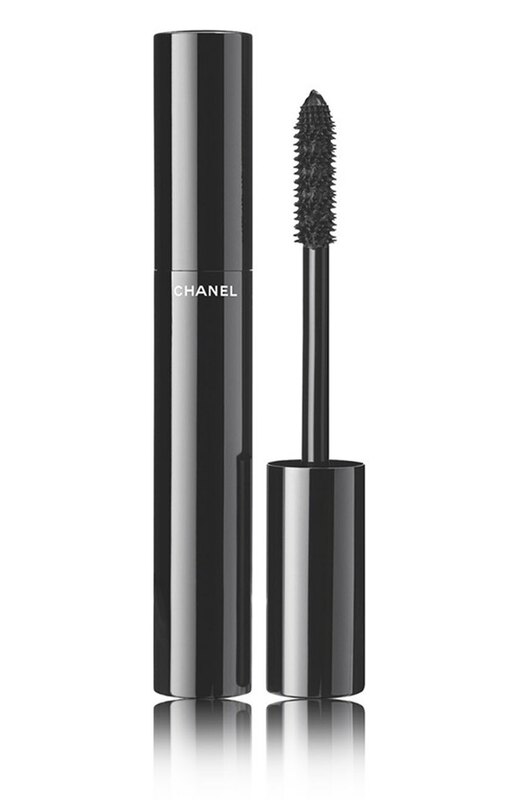 One of the products we got to play with was Chanel's volume mascara. Katy said she swears by the sample sized tubes, and it's been the best mascara she's ever used. You guys know I'm an eyelash junkie - I'm all about long thick lashes! So even though I kind of hate plastic brushes, I gave the sample tube a try...and have been using it ever since! It just really lifts and separates your lashes, while also building up the volume. I use one coat of primer, two coats of this, and one coat of Bobbi Brown's mascara for added thickness (I know it seems excessive...I just really love dark and thick eyelashes). Katy did say that she really likes the sample tubes more than the full size product, and I have only used the sample sizes so I can't verify her statement, but believe her. If you live near a store that sells Chanel makeup (like Nordstrom), stop by a counter and ask for a sample tube! It costs nothing, and maybe it'll be your new favorite. A sample tube lasts 2-3 weeks! 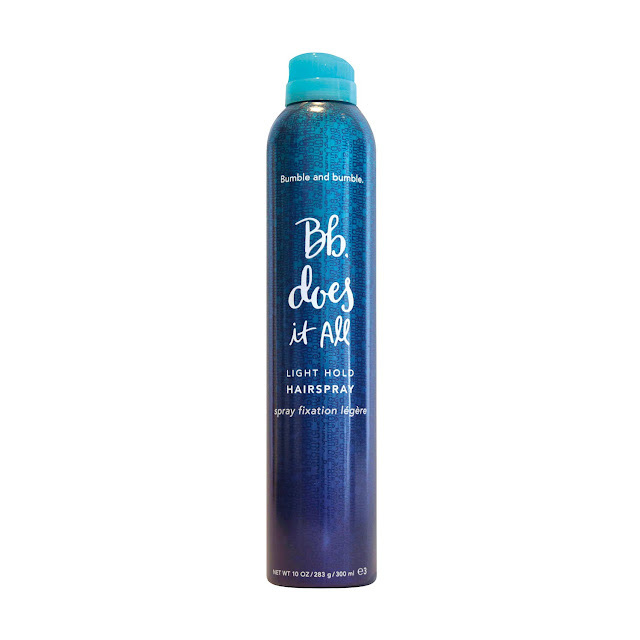 Bumble and Bumble Hairspray: When I got my hair colored back last fall, the stylist used this hairspray on my hair, and my curls lasted for THREE DAYS. That's unheard of for me! I remembered that she used a blue Bumble and Bumble hairspray, so when I finished my last bottle of hairspray (which, tbh, I'd had for like two years because I don't use hair spray every day), I bought a bottle of this. And you know, my curls really have lasted longer! I love the fine mist, I love that it's technically a light hold, and I love that it's a twist top rather than having a lid that will mostly likely go missing. 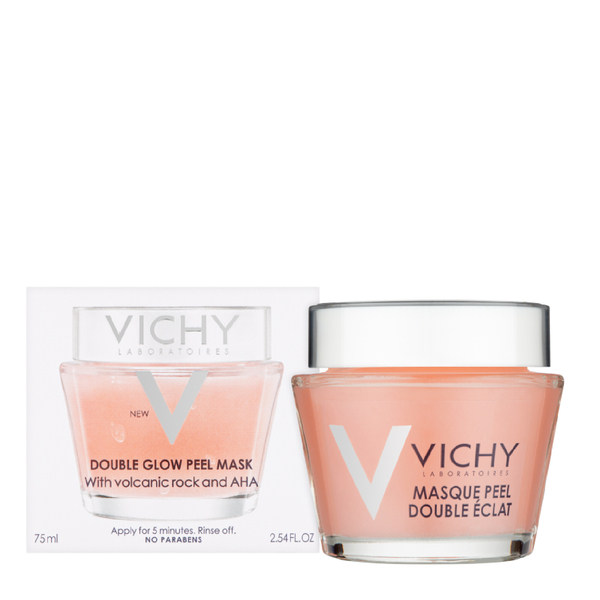 Vichy Double Peel Mask: I was sent this tub by Amazon to test out, which I will be honest, I was so excited about. My mom has been a lifelong Vichy skincare user - whenever we go to Germany, she buys like ten tubs of products to bring back with her to the US. I trust my mother implicitly, so whatever works well for her, I know will be a good product. I fell in love with this "double" peel face mask - it exfoliated mechanically with powdered volconic rock, and then chemically exfoliated with AHA. I use this about once a mask, and then follow with a face mask. I would say this is a pretty gentle peel/exfoliator - there is not redness or burning after use (I have pretty sensitive skin, so this is important!). Definitely gentle enough to use multiple times a week. Be on the look out for a chance to win a trio of Vichy masks in the near future! Alright! So this post is like three weeks overdue from when I promised I'd write about the couples match and how we approached this process, but as it turns out, it takes a lot longer to write out everything we did over a 14 month process! So, as a background, for medical students to be accepted into a residency program (where they receive the training in whatever field they go into - for me it's obstetrics and gynecology), they have to go through a process called "The Match". Long long story short, we apply to as many programs as we want, are offered interviews to residency programs based on our application, submit a rank order list at the end of the season, and then an algorithm figures out where everyone goes based on the applicants' and programs' lists. This video explains how that algorithm works so much better than I ever could - it even won a Nobel prize in Economics! The match is not a perfect system, but I do believe it probably makes this process as fair as possible. So the nice thing is that the NRMP has what is known as The Couples Match. It's the exact same as the normal match, but is complicated because you and your rank list are tied to another person. Watch this video to see how the algorithm manages that situation. The fun thing about the couples match is that you can couples match with anyone! I know best friends, cousins, and siblings who have gone through the couples match, as well as people who are dating, engaged, or married. Okay, so now with that background, here is how CR and I went about this process. Jessica is starting a new wellness series, and I found her story about when she was forced to stop working out that she had to find new ways to be healthy, and ways that made her feel better than just exercising away calories. Very excited to read more posts about this! 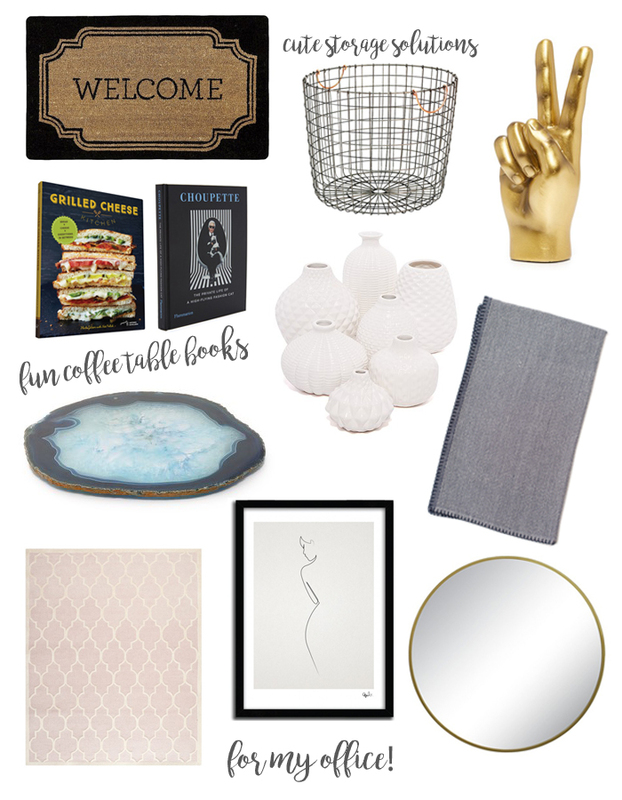 As I've started to fall down the house decorating rabbit hole, I've recently fallen in love with Copy Cat Chic. I love seeing the items where she finds an inexpensive dupe of a way to expensive for our budget item. 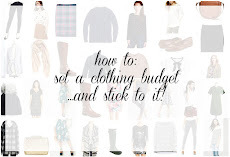 Not everything is my taste, but it's very inspiring to see the look for less! Love this girly meets rocker look on AJ! Plus check out the amazing deal she got on a designer bag - looks like perseverance paid off big time! 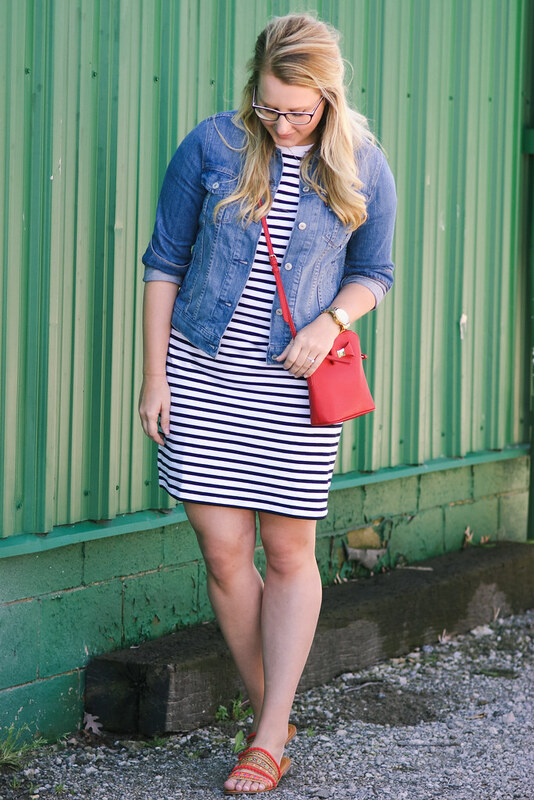 If you're looking for an easy throw on and go LBD, this Madewell version would be perfect for you! I love the details on the sleeve and neckline. How precious is Club Monaco's scalloped trench?! If only I wore jackets more often, I'd be all about that grey version! A day in the life of studying for Step 2. 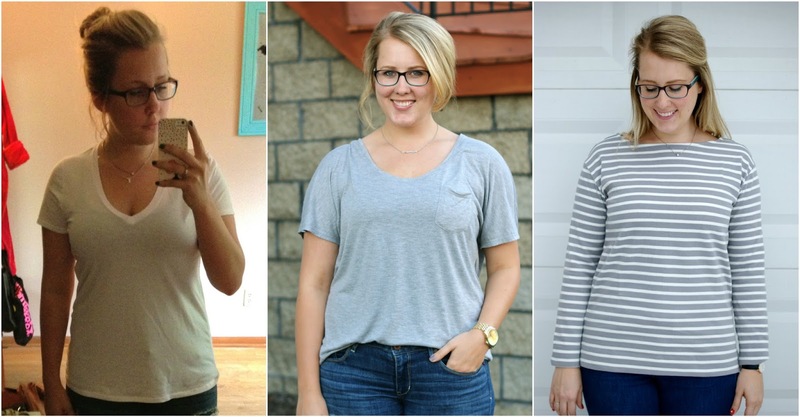 This shirt is still one of my favorites - it's so easy to just throw on and go! Do you have any rain coat recommendations? I'm looking for a longer bum covering style, and not black. I'm actually on that same hunt myself! We are going to Ireland in June, and I want a fun rain coat for the trip. The most inexpensive, and maybe actually my favorite, that I found was this version found at Target! It comes in five colors - my favorite is definitely the red! 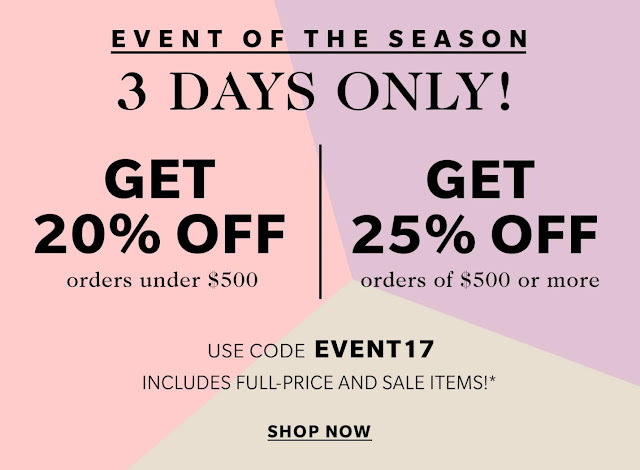 Cole Haan makes a raincoat that has a cute bow on the back, and comes in a really pretty blush color (plus it's on sale!). Petite Bateau actually has really cute versions too, although a bit pricy. Finally, the one I've been eyeing is Michael Kor's version - I just love the lining! 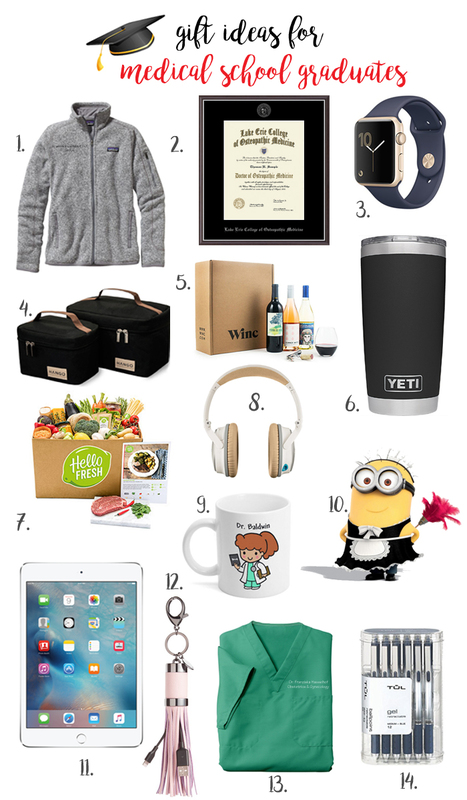 Are there any gifts you have gotten that you have loved/ would love to get for your engagement? Just a little something (on the "I'm starting med school this year" budget!) to help friends celebrate! Personally, I really loved just sharing a bottle of champagne with friends when we got them. Several people brought us bottles, and it was the perfect way to celebrate the occasion (especially because we weren't around friends or family the weeks after we got engaged). Another cute option if you are close with bride to be is a cute dish for her new ring! 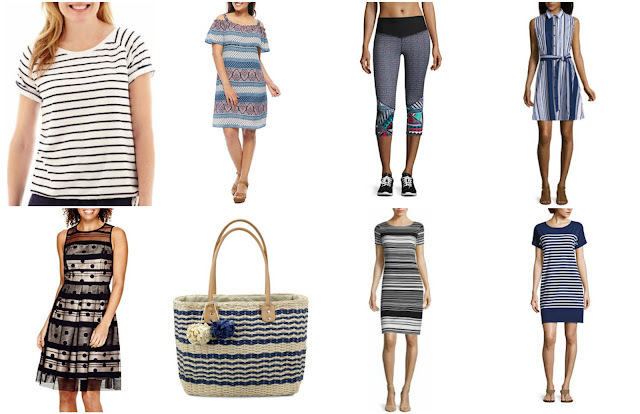 Shopbop has several that are around $15. Target makes an adorable marble + gold one, or you can get one personalized for her if you think she's going to change her name! 3rd year medical student here wondering about outfit ideas for interview dinners this fall (because it's more fun than thinking about ERAS, Step 2, etc). I am applying general surgery, which I have heard is more formal across the board. But I also want to show more style at the interview dinner than the black suit and collared shirt that interview day mandates. 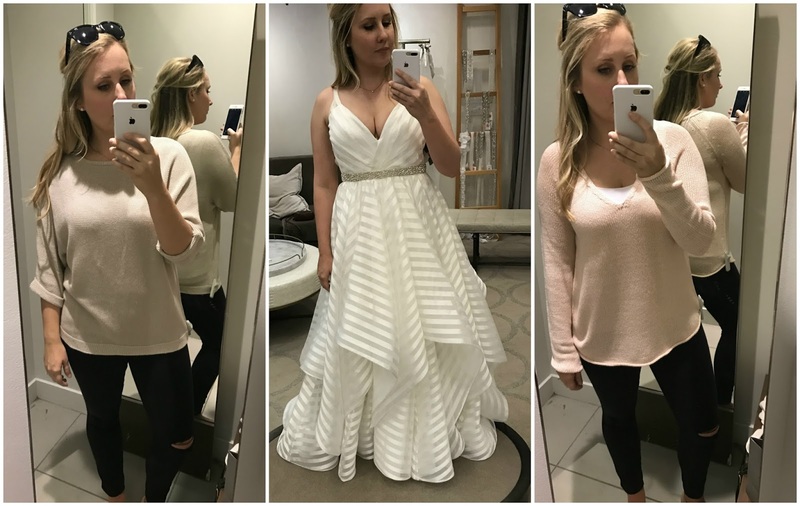 I am always up for a good, flattering dress (body type = skinny with no curves). What are your thoughts? The dinner the night before interviews are the perfect time to show a bit more of your personality through clothing, because exactly like you said, on your interview day you will be in a dark suit just like everyone else. I wore something business casual on my interviews. 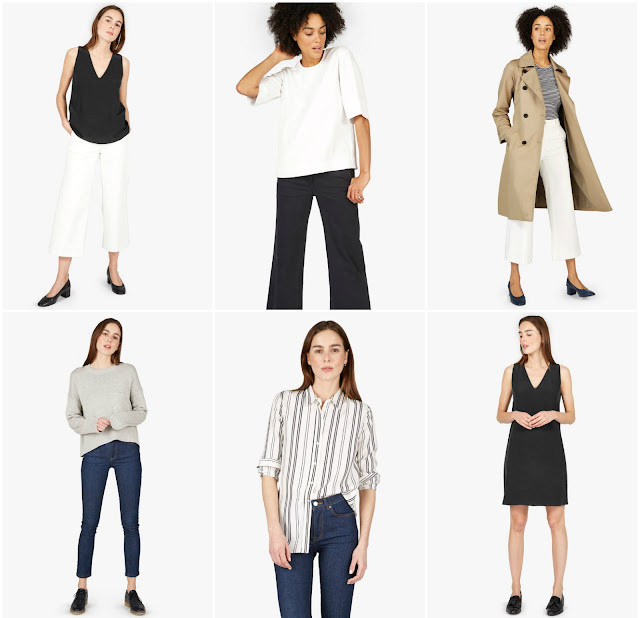 I almost always wore black jeans with either a white blouse with my camel blazer (now on sale!) or with a flowy blouse. I was comfortable, felt like myself, and my pants were stretchy enough for all the amazing dinners you eat! Don't forget that you'll be interviewing from October-January, so depending on what part of the country you apply in, you may want to be more covered up as well. Good luck! Interview season was a lot of fun, even at times when it was stressful, nerve wrecking, and time consuming! on the blog: discussing Save the Dates that we're hoping to send out next month! on the twitter: I am so so excited!! After eyeing this crossbody bag for a while, I've decided I'm finally going to get it in that amazing blush color...with a gold monogram, of course! My beloved blazer is now on sale + an additional 30% off! 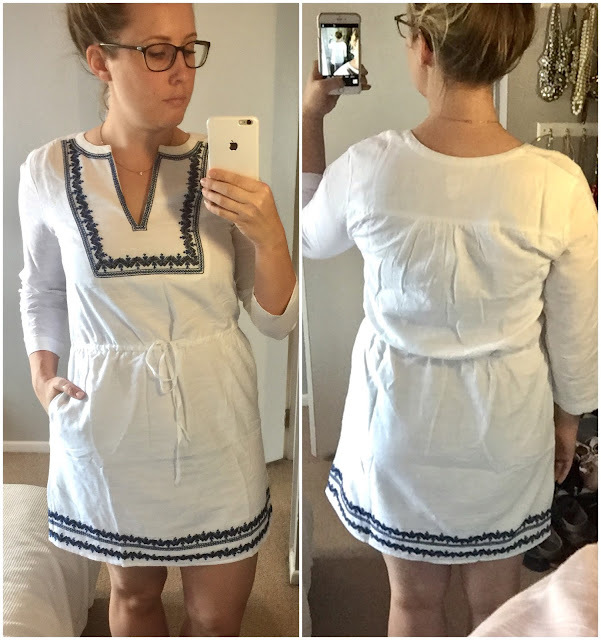 See my sizing review here. I also ordered this indigo button up - I think it's one of those super versatile shirts you can wear tucked into black dress pants or a darker skirt for work, but then you can also just wear over a white tank and ripped black jeans for a casual weekend look. Based off of experience with their sizing, I ordered a 10 Tall. We rented Passengers this weekend, and even though it got some not so great reviews, I loved it! Maybe it's because I want to live in space (like unrealistically want to, but I've always dreamed of it! ), and because parts of it speaks to me in a "making the best of any situation" life story, but I really liked it! Have I mentioned that we've been going to play trivia every Wednesday? It's my favorite night of the week now, between one of my favorite spin classes followed by a few hours of sitting in a bar with my friends playing trivia. Two weeks ago we won second place! 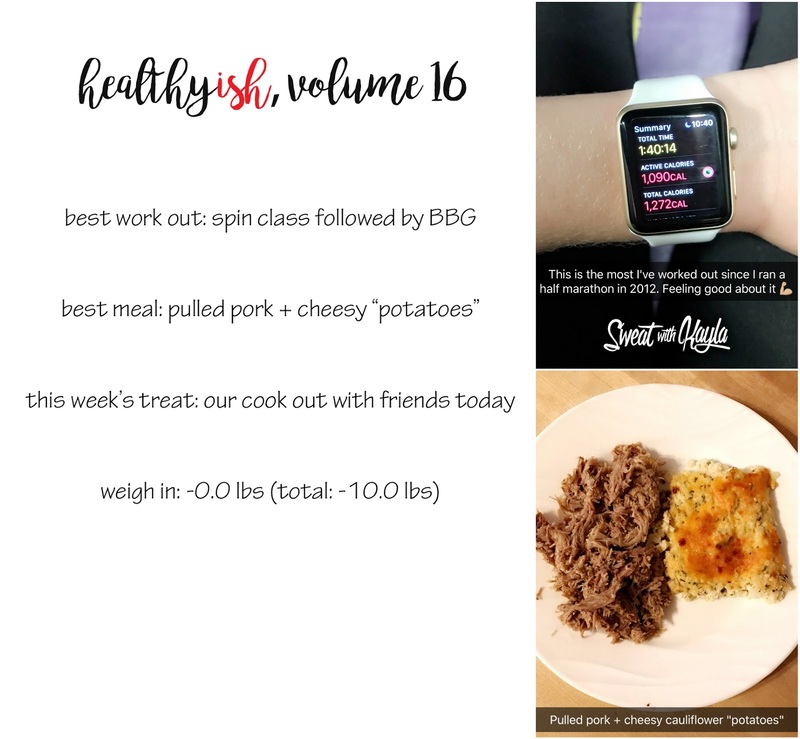 15 weeks in, and I finally hit the 10 pound mark! I am very excited about this milestone. This whole process was definitely about taking it slow and steady, and while some weeks were more slow than others, I'm proud of myself for really sticking with it! The work outs really just are a normal part of my week now, and every week I'm excited to find a new way to incorporate veggies and proteins into my diet. I have been far from perfect - you guys know that I love to eat, especially while traveling and spending time with friends, but it's this series that has made me come back to the cleaner eating part every week. This week, CR brought me a package of lobster cakes, and OMG, they were so good! 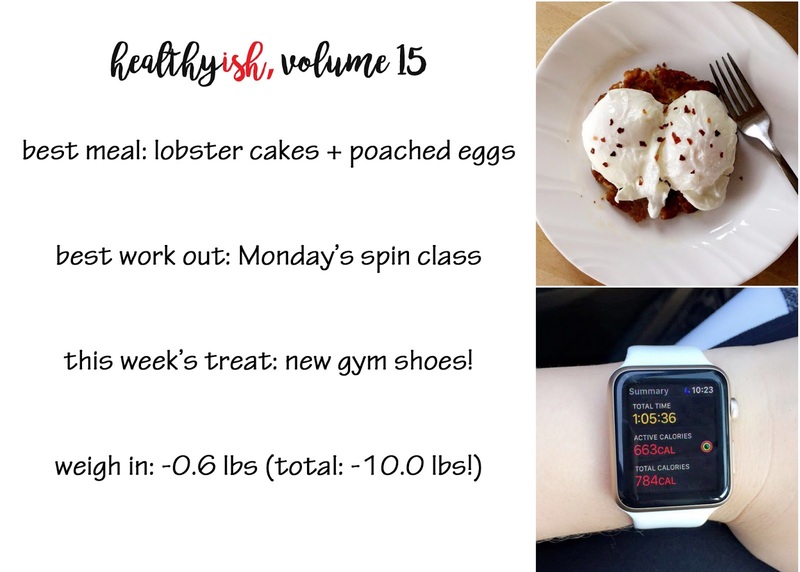 One cake is 190 calories, so I squished it down to make it a larger patty, and added two poached eggs, and that combo was so filling and protein filled that I always made it to lunch without needing a snack! They definitely aren't going to be a weekly occurrence, but at least once in a while! 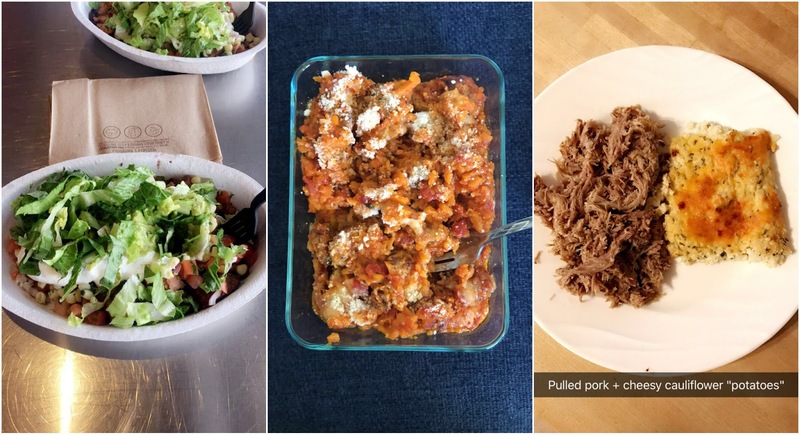 I met CR for lunch one day, and we had our go-to burrito bowls from Chipotle. I made a big casserole dish of the cheesy "potatoes" (that are actually cauliflower) and just basically ate that all week - it is so so good, and I plan on making it just about every other week from here on out. Dinners included our first attempt at making salmon at home - we tried out this recipe, but put the salmon in a packet instead of on the grill (it turned out okay, but will try something else next time). Also grilled chicken and salmon, and made a dinner of hamburger patties + a fried egg with roasted brussel sprouts and sweet potatoes when my best friend was here for a night. Last week's goal was to cut back on sugar. I was pretty good about this this week! We did order Girl Scout cookies from our friend's god daughter, so I allowed myself to have one at the end of every day, but besides that, I didn't eat any other sugary goodies! I'm making this next week's goal as well. It was really good to be mindful of the sugar, and it clearly made a difference for me, so I'm going to stick with the same goal for next week! I ordered these customized tennis shoes three months ago, and they have been sitting under my bed since then, waiting for me to hit the 10 pound milestone. I just love them! You can see what they look like here! Long ago, when I first discovered Pinterest, I also found a ton of wedding inspo, from fairytale dresses to venues to wedding invitations. I had a whole wedding pinboard even though I was 22 and years and years away from getting married. I remember I had this one pin of a wedding invitation that I was just in love with - it was white with curly gold foil font, and it was just the prettiest. 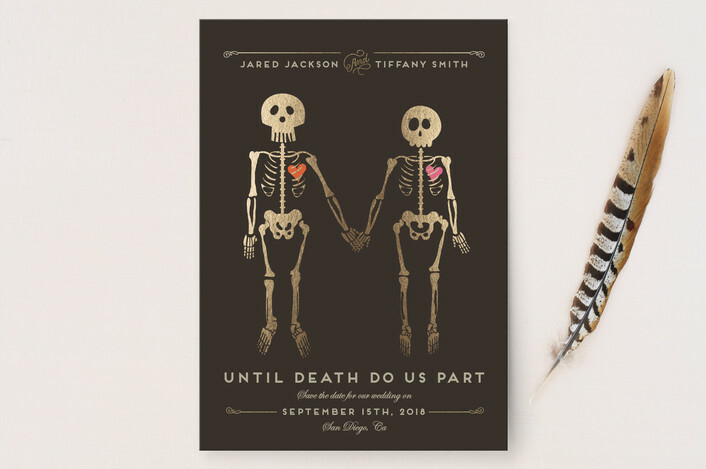 Like most gorgeous wedding invites on Pinterest, it was from Minted. 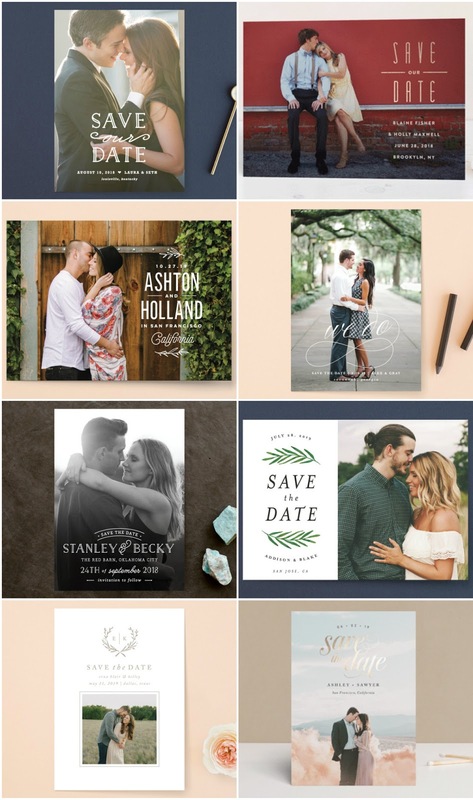 I've been working with Minted on some of my favorite posts over the years (see here and here), so when they offered to collaborate on something for our wedding, you guys, I almost cried. I was so excited because I just love their stationery, and every Minted invite we have ever received has always been gorgeous. It had to match the overall vibe of our wedding. We are having a barn wedding, and therefore are all about a bit of a rustic, outdoor, pretty theme. 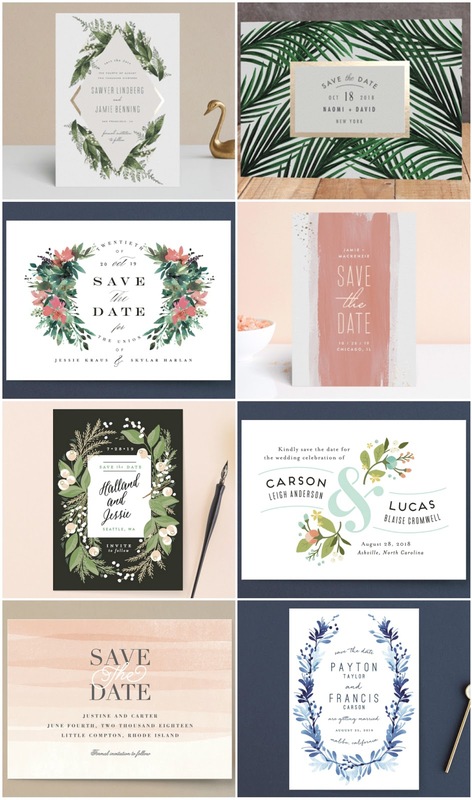 Our wedding colors are probably blush and navy, and I hope to include a lot of greenery and whites into the wedding decor. Therefore our invites should convey a similar theme. I would love for it to include gold foil. Luckily a ton of cards have the options of customizing the colors to any color in the rainbow, or about five metal foil options, which I love! The main font has to be easily legible. I love the really swirly fonts, but also want it be clear to read. Ideally, our names would not be the center point of the card. Both CR and I have longer names, but go by the shortened version in every day life, so I just didn't like the idea of our full names taking up the majority of the card. There were a couple of styles I loved so much that did have the names larger, but I just liked them so much I let it slide. So once I narrowed it down, the cards really started to fall into two categories - ones without pictures and ones with. Here are the final eight cards I settled on that didn't include a picture. I think if you made me choose right now, I would go with the diamante foil-pressed version. I love the greenery and the gold foil - isn't it gorgeous?! The other option is one with our picture on it. We have engagement picture session scheduled for mid May, and I think depending on how they turn out, I'd like to include them in the Save the Date. We keep all the Save the Dates we received on the fridge, and I just love looking at our friends and family every day. I also think it makes it a bit more personalized. For these ones, I'm having a really hard time picking out a favorite! I think my favorite is the XOXO card - they have a beautiful font, have the foil pressed option, and our names aren't the focus. I also love the whimsy of the We Do card, but it doesn't include a foil pressed option. But then I also really like the theme of the Vintage Love cards, although our names are the biggest part of the card! Am I overthinking this? Maybe. 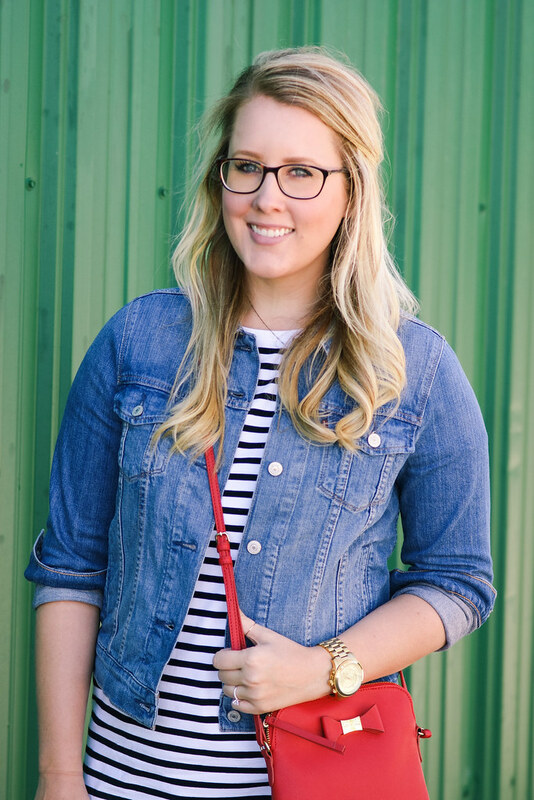 A couple of other things I wanted to mention about what I love about Minted. First of all, you can order a sample of any card for $1. Once we decide on our favorites, I'm going to order them in the style we want - I love that you can really get your hands on it before ordering 150 of them before you've even touched them. Also, and this is a big deal, is that they offer free recipient addressing on the envelopes. I sent out like 15 Christmas cards this year, and wrote the addresses by hand, and am not about to do that again x10, so this is definitely a huge perk. I'm thinking about getting a personalized stamp for the return address - we'll see what Pinterest finds for me! For now, I'll work on narrowing down our favorites, finding a dress for our pictures, and collecting addresses! Please note that we are receiving credit for our Minted Save the Dates, but I was not paid to write this post, and of course as always, all opinions are my own!